One of my favorite recipes from childhood was my mom’s potato soup. She’d make it in a stove-top pressure cooker and it was just so warming and comforting – the perfect tummy filler on a cold day. Of course it wasn’t vegan and I haven’t had it in many years. 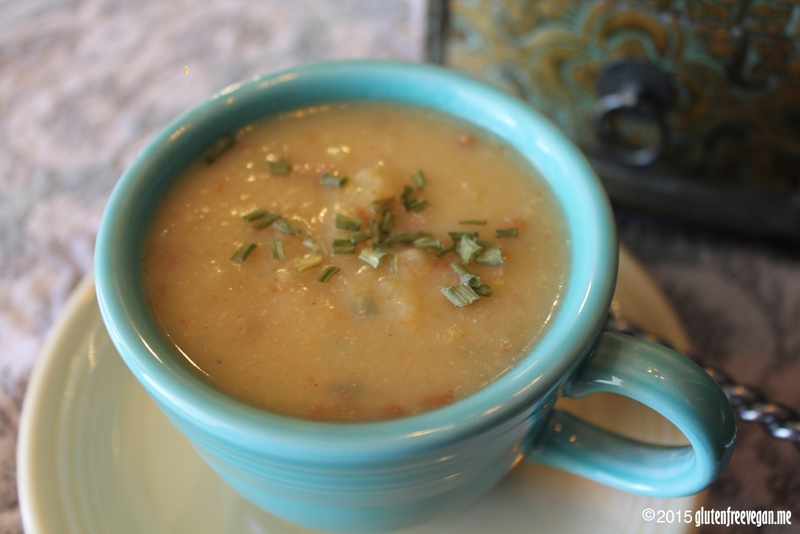 When I decided to create the soup series on the blog, mom’s potato soup was the very first recipe I thought of. I knew I needed to create a vegan version. Hubby approves too. Hope you like it as much as we do! 2 large carrots (6 – 8” long) washed, tops trimmed off. Cook potatoes and carrots in water or veggie broth until soft. (Note: do not cook in the plant milk; this is added after cooking.) My mom used to cook them in her stove-top pressure cooker and I still use mine for this recipe. It makes it easy to finish the soup on the stove, but any method to cook them soft works fine. In large soup pan (or stove top pressure cooker), on low heat, use a hand-held potato masher to begin mixing and mashing the potatoes, carrots, remaining cooking liquid. Fold in the plant milk. Add in the rest of the ingredients a few at a time and continue to mash until everything is mixed to desired consistency. Heat to desired temperature and serve. You can top with a few chives or stir in some vegan cheddar or mozzarella cheese for an extra kick. This entry was posted in Recipes, soups, Vegan Information and tagged carrots, comfort food, fat-free, gluten-free, glutenfreevegan.me, glutenfreeveganme.com, healthy, potato, recipe, soup, vegan cooking, vegan recipes, veggies. Bookmark the permalink.